Artist’s depiction of HD 98800, featuring the protoplanetary disk and inner binary pair. The outer binary pair is not shown. Quadruple star systems featuring two binary pairs are nothing unusual, nor is the discovery of a surrounding protoplanetary disk—a ring of gas and dust that gradually congeals to form planets. A star system located 146 light-years from Earth, called HD 98800, has all these things, but as new research published today in Nature Astronomy reveals, this system features an exceptionally strange protoplanetary disk. HD 98800 features an inner binary pair of stars and an outer pair. The pair on the inside, called BaBb, are in close proximity to each other, around 1 AU, which is the average distance from the Earth to the Sun. Its outer pair, called AaAb, is much further out at 54 AU—a much greater distance than the stretch between Pluto and the Sun (40 AU). But never mind the outer pair—it’s the inner pair and its surrounding disk that’s interesting. Normally, a protoplanetary disk rests along the same plane as the orbital plane of its binary star hosts. But not HD 98800—its protoplanetary disk rests perpendicularly to the plane of the binary pair at a right angle. It’s in a polar configuration, where instead of running east-west, the disk is running north-south, so to speak. Here’s another analogy: The inner binary pair are like two horses going around on a carousel, while the protoplanetary disk is like a giant ferris wheel with the carousel at its center. Astronomers have known about HD 98800 for several years. Previously, scientists had tracked the motions of its inner stars to see how they moved in relation to each other. Now, using the Atacama Large Millimeter/submillimeter Array (ALMA), Kennedy’s team was able to visually inspect the system and characterize the orientation of the protoplanetary ring surrounding the inner binary pair. 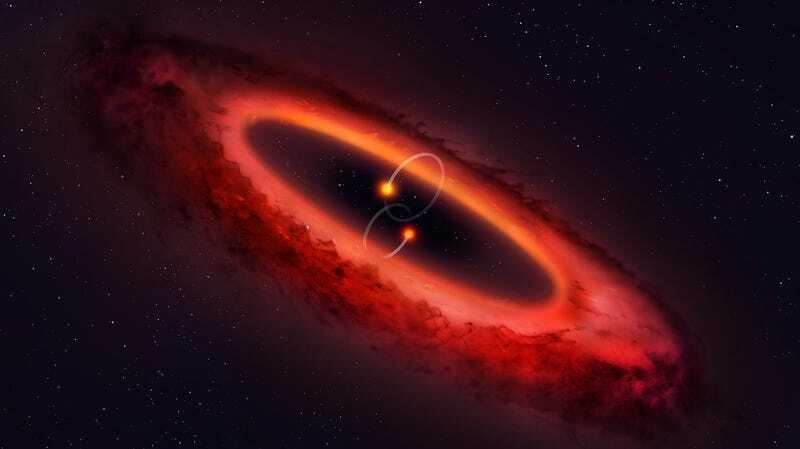 Artist’s depiction of the view from a hypothetical object within the protoplanetary disk, with the binary pair shown up top. The next challenge will be for astronomers to identify similar systems, and at different stages in their development. The discovery of actual planets within such as system would be particularly mind-blowing.